This was the characteristic signing off Sir Arthur C Clarke used whenever he made a video greeting to an international meeting on some important issue somewhere on the planet. From disarmament and new communications technologies to space exploration and conservation, he would offer the uniquely Clarkian take on the subject – in his witty, insightful and funny style. I have worked with and for him for half my life – 21 years – as part of his personal office in Colombo, Sri Lanka (not to be confused with the government-run Arthur C Clarke Institute which he had nothing to do with). In that time, I helped film a significant number of video greetings to gatherings of the world’s movers and shakers. Some of these were assemblies of sombre men and women in suits at the United Nations, Davos or Pentagon. Sir Arthur would deliberately poke fun at the pomposity and self-importance of these types, in a way that they could still laugh – even at their expense. Other events were less formal, but no less important: glittering gatherings of Hollywood or Silicon Valley professionals – some of who have more ‘soft power’ worldwide than military generals or secretary generals. Again, he would challenge the boundaries of imagination of these professionals whose mega-billion industries were built largely on imagination. In all these and more, Sir Arthur demonstrated another quality: the great economy of words. He hardly spoke for longer than ten minutes, or 600 seconds. The Grandmaster of the Soundbyte that he was, he knew just how to pack the right mix of power, fun and sense of wonder into each second. 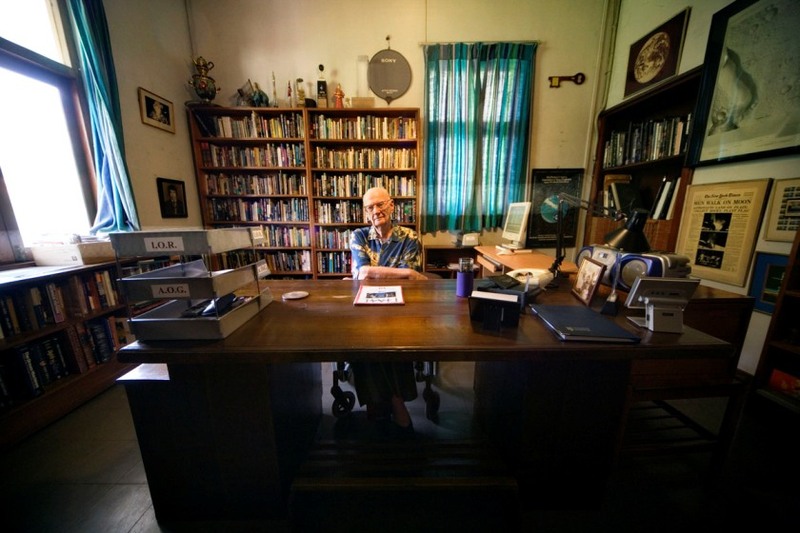 Confined to a wheelchair in Sri Lanka – the country he adopted – in later years due to Post Polio, Sir Arthur used either satellite links or the web to connect to many important scientific, literary and entertainment gatherings in far corners of the planet. And yes, he did often remind his eager listeners that he invented the communications satellite in his spare time in 1945 – and one of short stories (Dial F for Frankenstein) inspired a British computer scientist to invent the world wide web. When Sir Arthur said his Final Goodbye from Colombo in the early hours of 19 March 2008 at Colombo’s Apollo Hospital, there was no global witness. He was in the company of just five people – comprising family and staff. Aptly, however, the news of his demise went right around the world at the speed of light thanks to the comsat and web. In less than an hour, the whole world knew. And now its the world’s turn to say Goodbye to its most trusted ‘Man in the Future’. The world remembers, salutes and celebrates his genius, humanity and imagination. In doing so, many have turned to the last video greeting that Sir Arthur made, just a few days ahead of his 90th birthday (16 Dec 2007). This is about how that video was made. For once, there was no specific invitation from anywhere. But for several weeks running up to his birthday, we had seen considerable media and fan interest on how he feels like completing 90 orbits around the Sun. So in the last days of November 2007, I suggested to Sir Arthur that we should film a short video message – openly addressed to the whole world, sharing his reflections on turning 90. He liked the idea, and as has been the custom in recent years, asked me to draw up his speaking points. I spent several days going through dozens of his essays and speeches, both published and unpublished. When I had a draft, we worked long and hard on it to get everything just right. I saw how he could still ‘Clarkise’ any piece of writing, which showed no sign of wear and tear for the 90 orbits. This was a ‘no-budget’ production. Sir Arthur’s personal photographer Rohan de Silva had done many video greetings using a home video camera, but he and I agreed that this should be done more professionally. I mentioned the idea to our friends at Video Image (Private) Limited, the country’s top production company who had filmed with Sir Arthur for so many global TV channels and international clients. They immediately agreed to do it – for free. We didn’t have a tele-prompter, but realised the importance of Sir Arthur looking straight at his audience. So in just a couple of days, Brian Ratnasekera of Video Image improvised a working unit. I directed the shoot with Video Image crew on 5 December at Sir Arthur’s home. Allowing several breaks for him to catch his breath, our filming took the better part of that morning. The filming got off to a bumpy start. First the improvised tele-prompter had some teething problems, but these were quickly sorted. Then, in a very rare moment of disagreement, Sir Arthur said he wanted to be filmed wearing his Nehru jacket (which he affectionately called ‘My Doctor No suit’). We had already donned him in a colourful bush shirt and crew and I felt that this was the right attire for a message that was intensely personal and somewhat wistful. 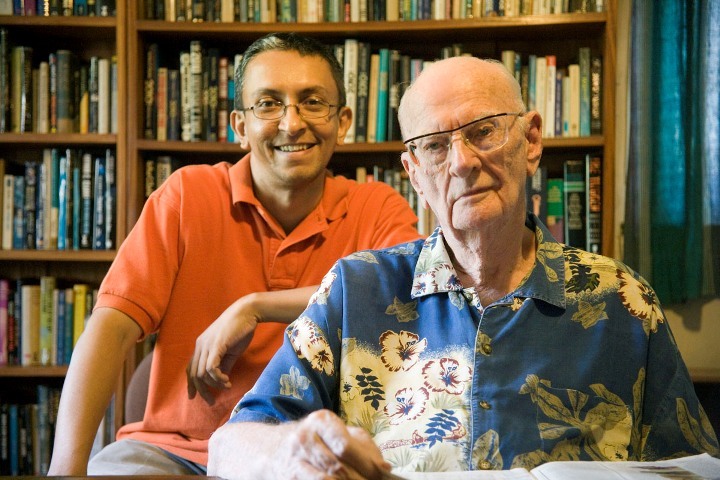 The shirt with large prints was far more characteristic of Arthur C Clarke than any formal suit. At that moment, I was the shoot’s director and not his long-standing spokesperson who would be more agreeable with his views and wishes. A few tense moments passed. Then one of Sir Arthur’s valets had a brainwave. Why not use the casual NASA jacket that Sir Arthur often wore when he felt the air conditioning was getting a bit too cold? That saved our shoot. He compromised, trading Nehru for NASA. Within seconds, he was back to his normal cheerful self. When the shoot got underway, he was at ease, speaking right to the camera and looking straight at millions of unknown viewers who would watch it for years to come. Reading our text scrolling gently upward on the tele-prompter, he missed out just one word out of nearly 900. We only needed to do a single re-take. That was impressive for a man who’d recently had cataract operations in both eyes. In the end, I knew we had a great piece – one where he looked back at a most remarkable career of our time, and looked forward to what lies in store for humanity. Over the next two days, my colleagues at TVE Asia Pacific did a simple edit – stringing together the few segments he’d filmed with breaks in between. Our IT Specialist Indika Wanniarachchi uploaded it to TVEAP’s YouTube channel on 9 December 2007. The next day, VideoImage uploaded it to their YouTube channel. This itself made some international news and and soon became a hit on YouTube. After surveying what has, by all measures, been a highly remarkable life and the astounding rate of technological development he has witnessed, Sir Arthur listed three ‘Big Wishes’ that he wanted to see happen – ideally in his life time (alas, that was not to be). Finally, he offered some personal views on posterity – a subject on which he’d been ambivalent at times. He signed off: This is Arthur Clarke, saying Thank You and Goodbye from Colombo! And this is Nalaka Gunawardene, saying Thank You and Goodbye to Sir Arthur. It was the greatest privilege of my life to have worked with you. Sir Clarke will remian in hearts for ever and always.Words are not powerful enough to convey the sorrow within the hearts of the people of science.Why couldn’t it have been Mary Kate Olsen or Lindsay Lohan??? What a great human being we have lost! This is a real tragedy for humanity, losing such a genius enlightened human. Earthlings will always remember you, as one of our prophets of the future. He took us to places and events beyond ourselves. He made us look into the future with a possitive attitude and and always with the thought that we humans with all our faults were deep down good. He saw the good…and he opened our minds to the possibilities of the future. There will never be another and he is laready greatly missed. It was an honour to know him. My God, it’s full of stars…..
Nalaka, you are so lucky to have known him personally. I knew him through his books which I read voraciously over the years. Sir Arthur was a Mighty Being, an amazing mind. I have picked this quote from the Upanishads which I think is a fitting stanza to describe him. His Leaving is our loss. The planet has lost a wonderful human. He must have had humanity’s progress in mind and not profits for himself when he decided not to patent his communications inventions. It would have made him astronomically rich but at the expense of the now ready, easy and cheap communication between peoples and nations. Thank you for the beautiful comprehensive tribute to Sir Arthur! You were truly fortunate to have known him personally. As well, we were exceedingly fortunate to have our horizons stretched and our human folly challenged by this writer and dreamer. Never doubt the power of a few well-chosen words! What you have done is wonderful. Congratulations and thanks. Is it not possible to put together everything Sir Arthur wrote and said about Sri Lanka, in a single compendium (with dates)? Did Sir Arthur have any specific – or indeed general – ideas/suggestions as to how we could resolve the Sri Lankan conflict? Thanks to everyone who left comments above. The 90th birthday video has been in heavy demand since Sir Arthur’s death on March 19. The number of views on TVEAP YouTube channel alone has now passed 100,000 – and it’s also available on several other locations on the YouTube. A few days later, Queen Elizabeth II launched her own YouTube channel for the Buckingham Palace! Always a believer in evolution, Sir Arthur placed a premium on adaptability. He was fond of quoting fellow science fiction writer Michael Crichton’s term ‘mediasaurus’ to describe those venerable media organisations that are too trapped in their own glorious past to adjust to the rapidly changing media and information landscape. I was privileged to visit him in this library several years ago – one of the greatest experiences of my life – and discuss his books and philosophy with him. He was greatly interested in the work I was doing in Colombo at the time, and sprung on me the biggest disappointment of my life. He was due a visit from Buzz Aldrin, and invited me to dinner – the day after I was leaving! The world is a poorer place without him. I and my family were privileged that Sir Arthur invited us to have dinner at his home in 1996 after my wife won a trip to Sri Lanka ina competition on the Discovery Channel. I remains a treasured highlight of my life. I sent birthday greetings and New Year greetings by email to Sir Arthur every year since we met, and he replied every time, except this year – I had a feeling that things were wrong. Thank you Nalaka for your article it brought the memories flooding back. BTW I have a feeling that we may have met when I was over there. If you want to read a reader’s feedback :) , I rate this article for four from five. Decent info, but I have to go to that damn google to find the missed pieces. Thanks, anyway! Dear Nalaka – you were so lucky!